On Jan. 11, 2017, Intelligence Online — a professional journal covering the world’s intelligence services — revealed that the pilots of Air Tractor attack planes flying from Al Khadim air base in Libya are private contractors working for Erik Prince, the founder of the company formerly known as Blackwater. Most of the for-profit aviators are American, according to IOL. Prince denied involvement in the UAE air operations. A year later on June 4, 2016, the Benghazi Revolutionaries Shura Council — a group with ties to Al Qaeda — released photos of a Turkish-make Mk. 82 bomb complete with a Paveway guidance kit, a weapon associated with the Air Tractor. The following November, BRSC published a photo of an Emirati AT-802 in the sky over the Ganfouda area of Benghazi. Shortly thereafter, the group circulated a video depicting an Air Tractor conducting an air strike. Now it’s increasingly evident that Prince, a former U.S. Navy SEAL officer, is behind the air raids. Prince’s ties to the United Arab Emirates are strong. He moved to Abu Dhabi in 2010, the same year he sold his stake in scandal-riven Blackwater. In Abu Dhabi, Prince founded Reflex Responses Company, also known as R2. In January 2011, several Arab countries hired Prince to help train a private army of 2,000 Somali recruits. And in May 2011, The New York Times reported that the UAE had signed a $529-million contract with Reflex Responses to recruit and train the so-called “Security Support Group,” an 800-member “foreign legion” for counterterrorism and internal security missions. Prince currently heads Frontier Resource Group, a logistics and transport company that’s working in Africa with funding from Asian investors. Prince’s sister Betsy DeVos is U.S. president-elect Donald Trump’s nominee to be secretary of education. Much in the way that Prince has fought to privatize war-making, billionaire Devos is a proponent of for-profit schools and a strong opponent of public education. Mercenary pilots are hardly new to Libya. In early 2015, the Libya Dawn Air Force — the main aerial rival of Haftar’s own Libyan National Army Air Force — paid the Ukrainian companies Glissada and Amber Tiger and the Jordan-based Caravana Middle East to find suitable pilots for its tiny fleet of fighters and helicopters. Three mercenary pilots flew Libya Dawn Mirage F.1 fighters from Misrata air base between June 2015 and July 2016. One of them refused to bomb LNA troops and was forced to leave Libya. One other carried out several air strikes. A third pilot died when his Mirage crashed in Sirte in June 2016 — possibly after being struck by enemy fire. The Tobruk government also employs for-profit pilots — specifically, transport crews form companies including Moldovan firm Sky Prim Air. The Moldovan company has ties to Emirati operator Oscar Jet, which also regularly flies to Libya. On Sept. 15, 2016, the Sky Prim Air Il-18D with the serial number ER-ICS flew from Tobruk to Zintan, transporting participants to the Nalut Reconciliation Conference. On Nov. 25, 2016, the same Il-18D flew from Tobruk to Benina air base loaded with equipment and, supposedly, medical supplies for hospitals and clinics in and around Benghazi. According to the LNA, the consignment of medicine and health equipment had arrived the day before at Tobruk on a flight from Germany. 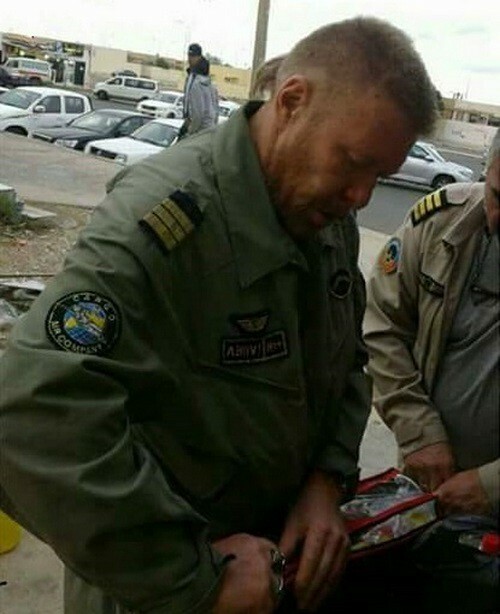 On Dec. 10, 2016, a foreign transport pilot wearing the inscription “Cargo Air Company” on the right shoulder of his uniform was spotted at Ras Lanuf, an LNA air base. The sighting came just a few days after various armed groups including Saraya Defend Benghazi and Petroleum Facilities Guard attacked LNA facilities in Libya’s Oil Crescent. The LNA repulsed the assault with a devastating series of air raids. Cargo Air Company may, at the very least, be involved in transporting oil workers. On Dec. 12, the LNA deployed SA-9 air-defense systems to the Oil Crescent. Someone had to fly them there — and it probably wasn’t the LNA itself, as Haftar’s army lacks large cargo planes of its own. Following the LNA’s capture of Brak Al Shati air base on Dec. 11, 2016, the Oscar Jet Il-76TD with the serial number ER-IAX transported a delegation from Benina to Brak Al Shati. Two days later, another Il-76 from Sky Prim Air landed by night at the same air base with an unknown shipment. On Dec. 15, 2016, the Sky Prim Air Il-18D hauled 60 million dinars from Libya’s central bank to Birak Al Shati. The same aircraft landed at Zintan on Jan. 1, 2017 with Libyan military officers on board. The officers had recently graduated from training in Jordan. The recent meeting between Haftar and Russian defense minister Sergey Shoygu on board the Russian aircraft carrier Admiral Kuzentsov off the Libyan coast suggests escalating foreign assistance for the LNA. Prince’s pilots in their Air Tractor bombers might have a lot of company.